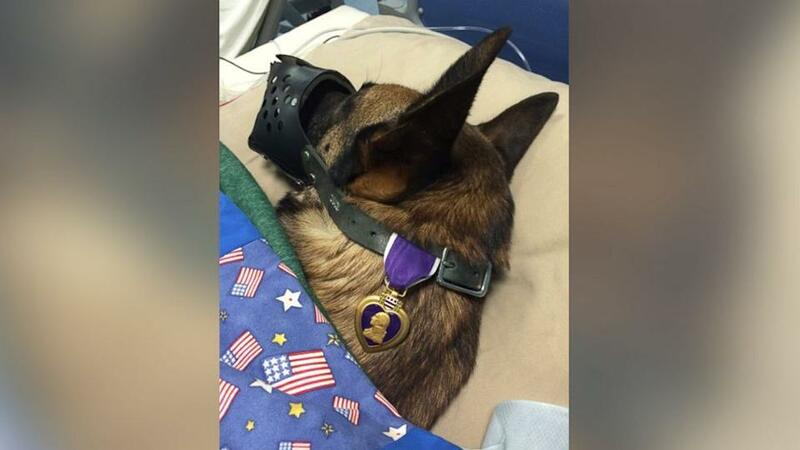 This heartwarming photo of injured military dog Rocky with his Purple Heart is going viral, and his handler, Specialist Andrew Brown, told ABC News the story behind their partnership. Brown and Rocky, who have been partners for two years, left Fort Hood for Afghanistan this October. Two months later, they were searching a compound when they were both injured by shrapnel from an improvised explosive device (IED). After the explosion, they were flown together to Kandahar, Afghanistan, where Brown and his dog were awarded Purple Hearts, Brown told ABC News today from Walter Reed hospital in Washington D.C. But Brown, a husband and father of two, credits Rocky for their work. Rocky is considered an American soldier, Brown explained, adding that a dog’s rank is one above his handler’s. “He does everything,” Brown said. “I’m just really a guy with a leash. I bring him to the area and let him do his thing. If he responds, I translate that … let them know my dog got a response right here. “I know the way he works, I know his change of behavior,” he said. As Brown recovers and prepares for more surgeries in D.C., he is holding onto both his and Rocky’s Purple Hearts, he said. Rocky, meanwhile, is thousands of miles away in Germany, where he faces more surgeries, Brown said. “Dogs are just resilient like that,” he said. Visit :https://gma.yahoo.com/story-behind-injured-military-dogs-purple-heart-201949235–abc-news-topstories.html# for more information.